Looking for movie tickets? Enter your location to see which movie theaters are playing Nocturnal Animals near you. This week on Indie Movie Guide... a powerful and true love story, a powerful love witch, a multi-storyline film about love and two oscar-nominated film you will love! This week on Indie Movie Guide Alicia recommends 'Manchester by the Sea', 'Nocturnal Animals', 'Asperger's Are Us', and 'Don't Think Twice'. In the premiere episode of Indie Movie Guide, host Alicia Malone runs down her favorite movies from the Toronto International Film Festival. Nocturnal Animals: Featurette - What is Nocturnal Animals? 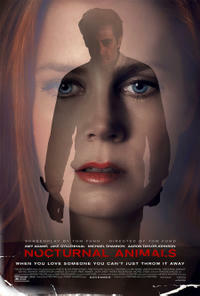 A writer (Jake Gyllenhaal) asks his ex-wife (Amy Adams) to read a manuscript of his dark new novel.